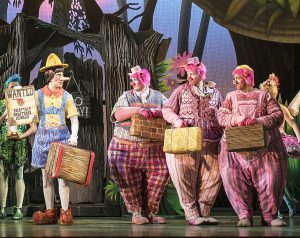 THE Three Little Pigs are currently performing in Shrek the Musical at the New Victoria Theatre. They have given the News & Mail their impressions of the town. Pig 1 (Straw), said: “Our time in Woking has been great – everyone’s so nice and there’s so many places to eat.” Pig 2 (Hay) was taken with the name of the café in The Lightbox – The Tipsy Pigs. Shrek the Musical runs until Sunday 10 June.